Spiritual well being of human is the major thrust of fasting during Holy month of Ramadan. As Muslims stay away from food, water, etc during the day for whole moth, they also keep themselves away from bad thoughts and wrong life patterns as well. They are kind to others and never think of hurting their feelings or make them suffer. Muslims cultivate healthy habits and positive thinking and completely overcome narrow mentally. Thus they indeed become true humans, real Muslims as envisaged by Islam and prescribed in the holy Quran. Once again the Holy Ramadan month has come to purify the minds of Muslims as the chief blessings of Allah (Arabic world for God) to help the humanity of believers live much better than now and after the holy month and safe-land in the Hereafter life. As the Holy month is coming to end Muslims should ponder over the meaning of the Holy month and its spiritual value. This helps us to gauge the change that may have happened in our lives and our very perceptions of life. Muslims are under intense surveillance and attacks globally while many Muslims deliberately harm fellow Muslims and bring bad name for Islam by their foolish misbehavior even with Muslims. It is because they have no faith in God or Islam. Whether they fast sincerely or not, they live for themselves, their focus being on scheming and material profits, even work against Islam and Muslim community. These Muslims harm Muslims and others as use Islam and community for their own upliftment; they are a shame to Islam and Muslim community.But those who observe fasting and offer prayers should be on guard from evils of all kinds. There are precautions that could help Muslims to overcome that and attain spiritual heights the Ramadan fasting is meant for. Muslims should realize that fasting during the holy Month is not a formality. Attaining self-purification through spirituality is a major goal of Islamic fasting-worship, especially in the month of Holy Ramadan, although unfortunately Muslims fast for certain material benefits. The entire global nation of over 2 billion people, men and women, young and old, rich or poor - all together, for a whole month - not eating, not drinking and not having intimate relations, during the daylight hours. This describes the month of Ramadan. Fasting as a spiritual practice is found not just in Islam but in all religions but there are fundamental differences as Islam prescribes clear cut norms- from dawn to dusk every day for full month of Ramadan. Fasting in Islam does not just consist of refraining from eating and drinking, but from every kind of selfish desire and wrong-doing. The fast is not merely of the body, but essentially that of the mind and spirit as well. The physical fast is only a symbol and outward expression of the real, inner fast. The founders of various other faiths (Buddha, Moses, Jesus, others) practiced quite rigorous fasting as a preliminary to attaining their first experience of spiritual enlightenment and communion with God. However, it is not that only Holy prophets fast but also all believers also do so, and they all do so not as a mere formality but with a spiritual purpose useful for the human lives. Islamic fasting, especially in Ramadan month, is significant for its content and length - from dawn to dusk without food or drink. Ramadan is the ninth month of the Islamic lunar calendar which is a month of blessed, month of revelation of the Holy Quran, andmonth to achieve Jannah, and therefore the best month in a year Muslims look forward each year to fulfill their spiritual duties. Fasting is one of Islam's five main pillars. The other pillars are the belief in one God and the Prophet Mohammed as His Messenger, praying five times a day, completing the pilgrimage to Mecca for those who are able and giving charity or "zakat". Though fasting is mandatory for all Muslims upon reaching puberty, as long as they are mentally and physically sound, it should notbe observed as amereformality. 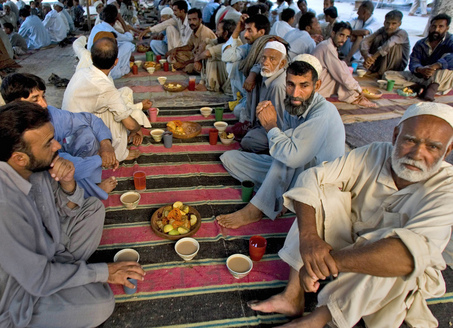 Those elderly and chronically ill are exempt from fasting; however, it is incumbent upon them to feed the poor instead if they possess the financial means. Concern for less privileged and poor is the thrust of Islamic fasting. While fasting, Muslims are expected to reflect upon good and bad things that have happened to them in the past, especially the last Ramadan month. Those Muslims who have been Islamic, positively religious, upright with truth, who avoid ill speech, arguments, loss of temper and malicious behavior, who have served the cause of Islam and Muslims, helped fellow Muslims and others in difficult positions, who have kept the word given to others - are the blessed ones - especially those who undertook the fasting and did only good things, thought only of good positive tidings! Remember, Allah warns us of consequences for each of our good or bad actions and we would be held accountable for everything we do or refuse to do. It is quite possible that Allah does not punish quickly enough those who commit hypocritical errors or crimes but that does not mean we can justify everything we do. The Holy Quran informs the believers, the Muslims, that fasting, like other Islamic duties, is prescribed for them. “O you who believe, fasting is prescribed for you as it was prescribed for those before you, so that you may guard against evil.” (Holy Quran, 2:183) Allah says: “And when My servants ask you (O Prophet) about Me, surely I am nigh. I answer the prayer of the suppliant when he calls on Me, so they should hear My call and believe in Me that they may walk in the right way.” (ibid, 2:186)’ “And swallow not up your property among yourselves by false means, nor seek to gain access thereby to the authorities so that you may swallow up other people’s property wrongfully while you know.” (ibid., 2:188)’ “He who does not give up uttering falsehood and acting according to it, God has no need of his giving up his food and drink.” (Holy Prophet Muhammad (SAS). Prophet Jesus fasted forty days and forty nights, and explained it by saying: “Man shall not live by bread alone, but by every word that proceeds from the mouth of God.” (Matthew 4:2-4.) Prophet Moses also had fasted forty days and forty nights (Exodus 34:28). Purpose of fasting in Islam as practiced by the Holy Prophet Muhammad (SAS) include (a) develop and strengthen our powers of self-control, so that we can resist wrongful desires and bad habits, and therefore guard against evil. In fasting, exercising our ability of self-restraint, so that we can then apply it to our everyday life to bring about self-improvement; (b) to attain nearness and closeness to Almighty Allah (God) so that He becomes a reality in our lives. The rigors of fasting purely for the sake of following a Divine commandment, knowing and feeling that He can see all our actions however secret, it intensifies the consciousness of God in our hearts, resulting in a higher spiritual experience;(c) to learn to refrain from usurping other’s rights and belongings. In fasting we voluntarily give up even what is rightfully ours; how can then we think of taking what is not ours but someone else? (d)Charity and generosity is especially urged during Ramadan. We learn to give, and not to take. The deprivation of fasting makes us sympathize with the suffering of others, and desirous of alleviating it; and it makes us remember the blessings of life which we normally take for granted. The object of fasting is that a person should abstain from the food which nourishes the body and obtain through fasting the other religious food which satisfies and brings solace to the soul. Hazrat Mirza Ghulam Ahmad said: “People are unaware of the true nature of fasting.. Fasting is not just the state of remaining hungry and thirsty. Its nature and effect can only be discovered by experience. The human makeup is such that the less food is consumed the greater is the purification of the soul and the development of the powers of inner vision. God’s purpose is that you should reduce one kind of food (physical) and increase the other kind (spiritual). The person fasting must remember that the aim is not simply to remain hungry; he should be engrossed in the remembrance of God so as to attain severance from worldly desires. Many people have tried different kinds of fasting. Some will drink only juice for a day, or eat only fruit, or stay away from any sugar or starches, or leave alcohol for a period of time. Yet, it seems strange to most folks, the idea of Muslims fasting in the month of Holy Ramadan. What is the significance of Ramadan? Isn't it a very harsh practice?Is it just a time when Muslims sleep and fast and hardly work all day; and eat, drink, enjoy and stay awake all night? What really is the spirit of Ramadan?